The products are produced by selected family farms and properties. There is an availability on the necessary certifications, and most of the products have particular specifications (origin name POP, geographical specifications PCE, traditional products, sustainable agriculture etc). Thus, every item, packed or not, has a production label of the producer and the reference “Syntrofia”, in order to have an obvious distinction of the other items. At the same time, it ensures the important immediate collaboration between the responsibility and quality of the consumers and the producer. Finally, each item, has a specific label that informs the consumer for the procedure and the origin, along with its specific characteristics and its use. Item categories: cold cuts, cheese, dairy, herbs, sweets, legumes, pasta, spirits (wine, beer, ouzo etc), herbal tea, honey, dough products, natural cosmetics, olive oil, salted, spices, seasonings, hypertrophy, monastery products from mount athos and many more. By choosing the finest from our gravel products we prepare the cordial and warm environment of exhibition, offerings and hospitality over-seas. 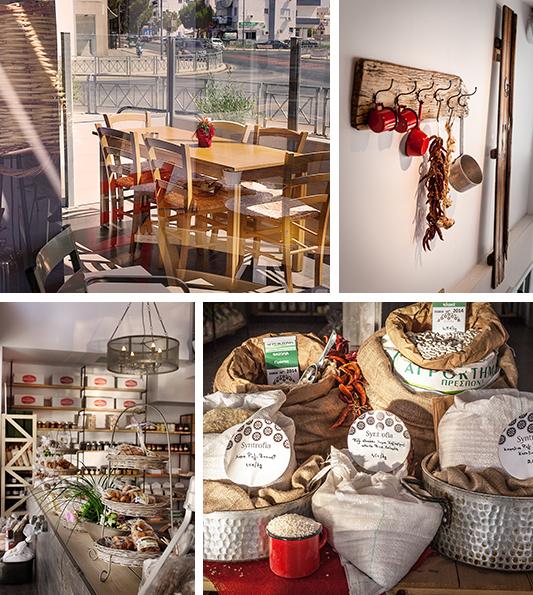 The shelves and the fridges are a space of dozens of small producers around Greece and Cyprus. It is a space that accommodates, exhibits and provides the selected and authentic products as well as their names, with a label of the care taking and the responsibility of their creators. The kitchen, the tables, the counters are all part of the tastefulness where all the products are prepared at a sight and become dishes which are accompanied by wine and essences, from all the Greek and Cypriot variety. 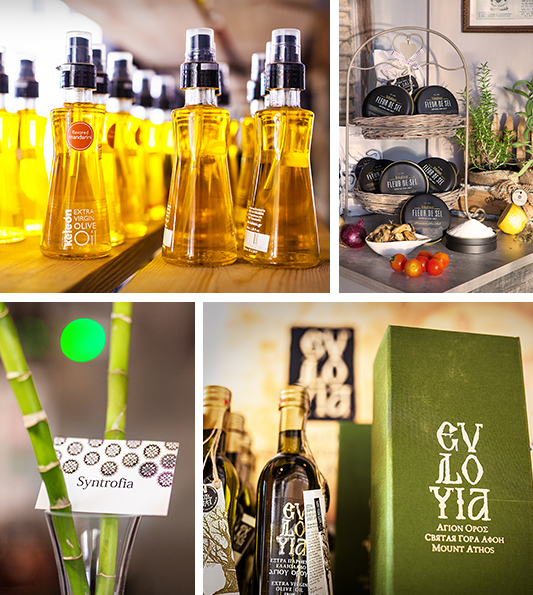 To conclude, the usage of the art space and its equipment, we provide a communication, the meeting and the activities of an open community of producers and friends by the greek gastronomy and our own richness in flavours. The bonding between members and the national vision are the main characteristics that our Syntrofia envisions. Hospitality: Syntrofia offers the products with their authentic from in a configured room of hospice. The consumer has the ability to taste the products, and also experience his stay at the setting during all the times of the day. The character and the functioning of the setting, are adjusted and accompany their visitors from their morning cruller to their dinner time wine. • Breakfast and snacks: traditional pies, crullers, snacks and fresh sandwiches with a variety of your own selection, with fresh juices and a variety of herbal teas. • Mid day and night: cold platters of cheese and cold cuts that are accompanied with local beers and wines by selected wine producers. A light menu with traditional pasta, savory fish, fresh salads and tasteful traditional dishes. 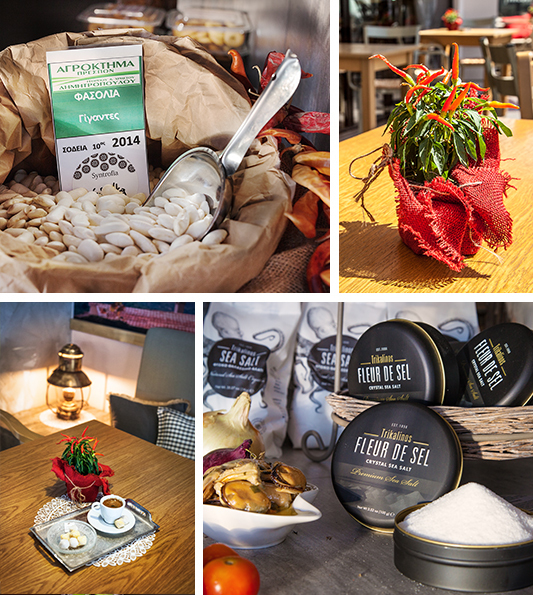 • All hours: herbal teas, beverages and different traditional sweets. Shelves: the products are exposed in the store and the vistor could be informed, to be provided or even give on his order for a home delivery. HoReCa: Syntrofia serves and supplies with teir products, the professionals of the place like hotels, restaurants and event organizers. It does not provide its items to other markets. On line shop: just like the consumers and the collaborating professionals, can be soon informed and give in their order on the online shop of Syntrofia.